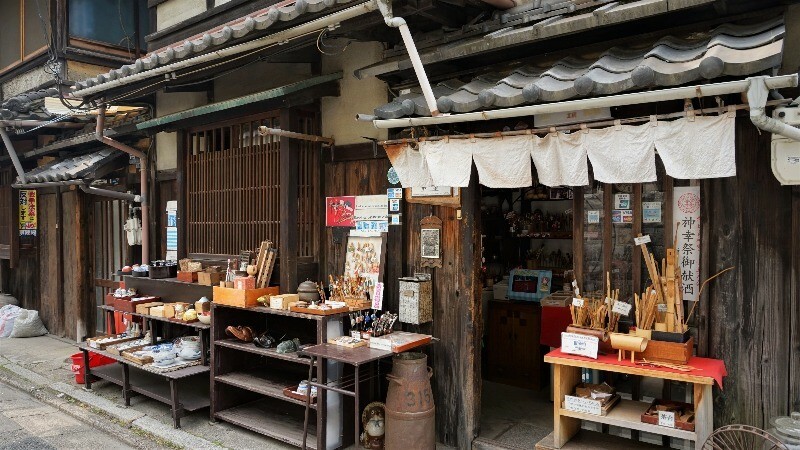 The history of Kyoto begun in the ancient times, and so the handicrafts of Kyoto, like the food culture, including traditional Japanese sweets, also have a long history behind them. But besides going to the long-established shops of Kyoto to buy these things, you can also try your hand at making these quintessentially Kyoto-like and profound crafts. What makes these experiences even more special is that they take place at machiya townhouses, many of them built over 100-years ago. Since you’re coming to Kyoto, it would be a shame not to take the chance to experience the history and traditions of Kyoto during your trip! At Kyoto Experiences Waraku you can find all kinds of handicrafts, like earrings made of Japanese paper, hair ornaments, and cell phone straps, and they’re all have something very Japanese in their design. 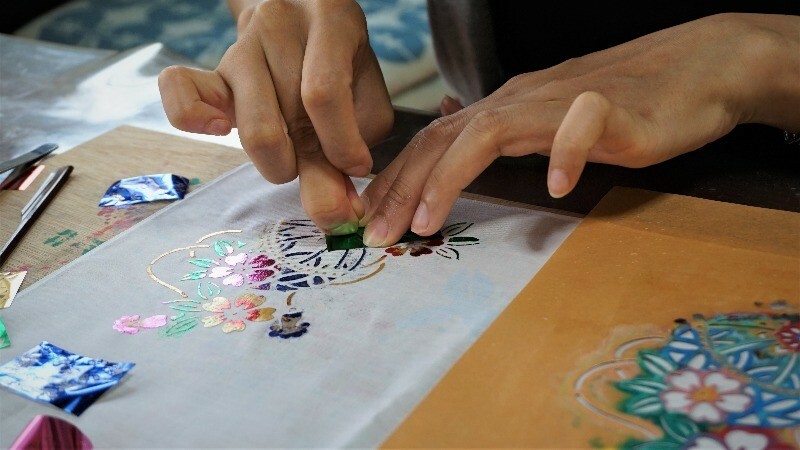 Here you can try your hand at yuzen-dyeing a handkerchief or a canvas bag, among other choices. You can feel the essence and beauty of Kyoto’s culture here. When you get to see the finished product, I’m sure you’ll jump with joy. They also have classes for making chopsticks and making earrings from Japanese paper. Can you try your hand at playing some historical Japanese instrments? Yes, and in a traditional Kyoto-townhouse, at Soushunan. 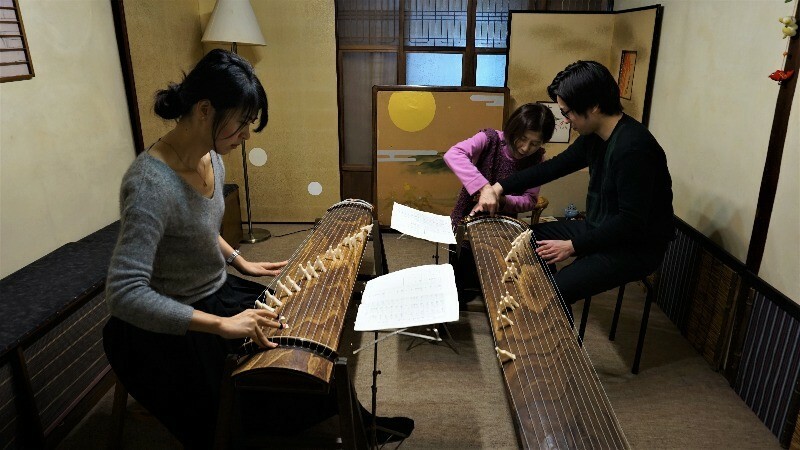 The machiya townhouse is one hundred years old, so you also get to enjoy the historical atmosphere of it while you learn to play the koto, a Japanese stringed instrument. 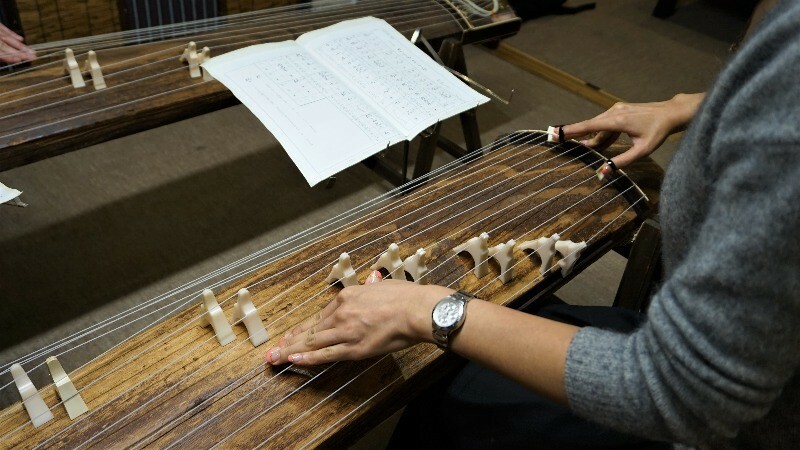 Even if it’s your first time touching a koto, you don’t need to worry, as the teacher will patiently teach you how to play (in English!). And soon you’ll get to enjoy the melody you’re playing – it’s weird how playing an instrument can be so easy yet so difficult! After playing a song, I felt like I had achieved something big. 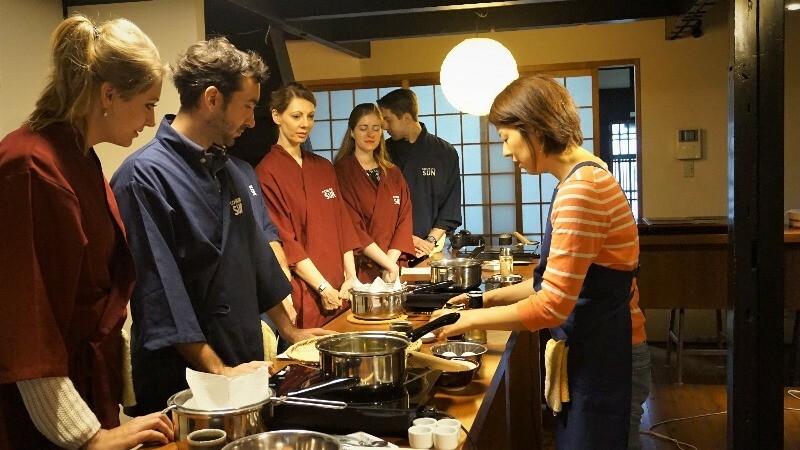 Do you want to learn how to cook Japanese food? At Cooking Sun you can do just that, in a beautiful machiya townhouse setting, under the watchful eye of a friendly, professional chef. 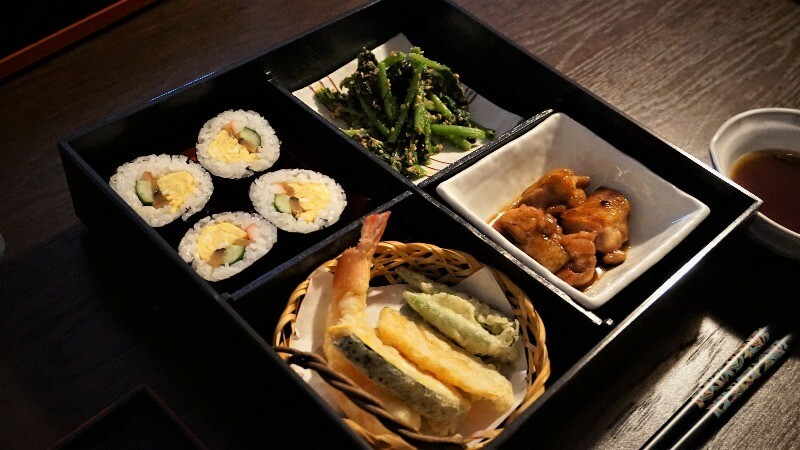 You get to learn how to make a Japanese lunch box or izakaya-dishes. You get to learn how Japanese food is made here, from the basics: you make tempura starting with making the batter; you’ll learn how much vinegar to put into the sushi rice, and you’ll also get to marinate your teriyaki chicken yourself. The finished product really speaks for itself. The food you cook yourself just tastes better, don’t you agree? 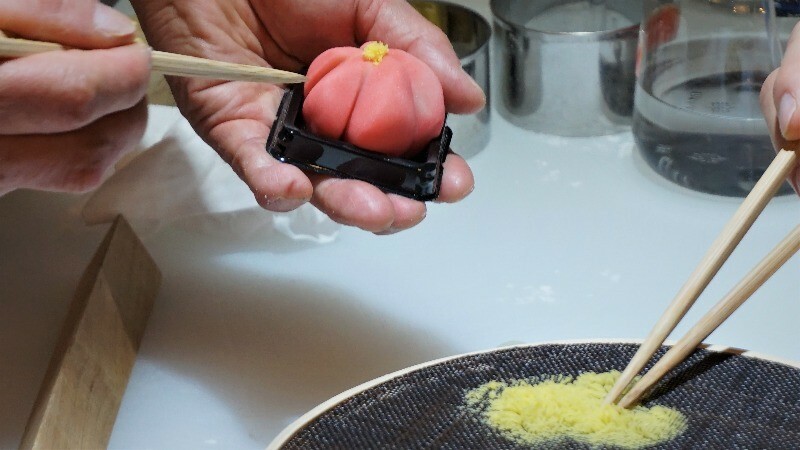 Traditional Japanese sweets are something incredibly delicate and beautiful, and many people are interested in them, but making them may sound a bit too difficult. But at Kanshundo, a long-established Japanese sweets shop, you get to learn from professional Japanese sweets artisans how to make these seasonal treats. Making traditional sweets takes patience, and it’s not easy. But don’t worry! 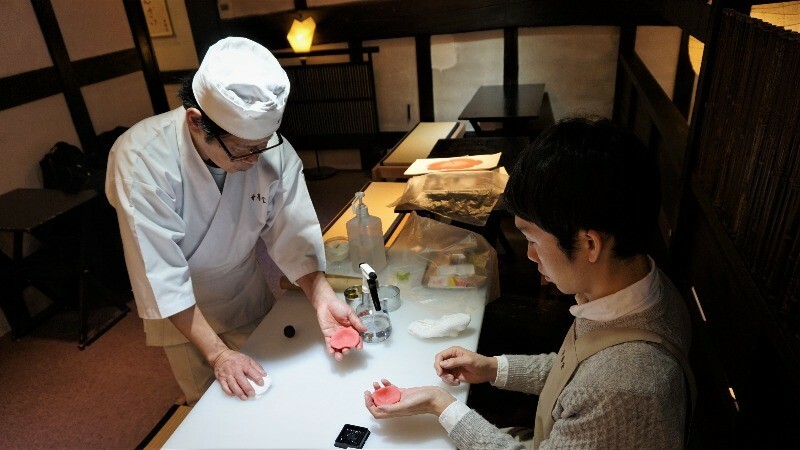 You’ll have a professional Japanese sweets maker to teach you how to properly make traditional Japanese sweets, or wagashi, as they’re called in Japanese. You can take the sweets you make home, but note that you should eat them as soon as possible, otherwise they will harden and the texture will not be as good. Getting to experience the culture of Kyoto first-hand in a machiya townhouse is something that is sure to leave a lasting memory. Through these experiences, you can also try to understand the profoundness of Kyoto’s culture. So when you come to Kyoto to see the temples and shrines of this old capital city of Japan, don’t forget to also book some experiences to make your trip even more unforgettable! The way the machiya of Kyoto are built to be comfortable for each of the four seasons of Japan is pretty great, isn’t it? They’re something very traditional, but many shops that are in a machiya bring something new to it. I wonder, did you find these machiya townhouses interesting? I hope you’re going to at least some of these shops, and enjoy the culture of Kyoto during your travels even more!